This is the tenderest part of a pork loin. It spends the night–or several hours at least–in a plastic box or bag in the fridge, bathed in a simple marinade. Then it’s cooked in a hottish oven for between 15 and 20 minutes. 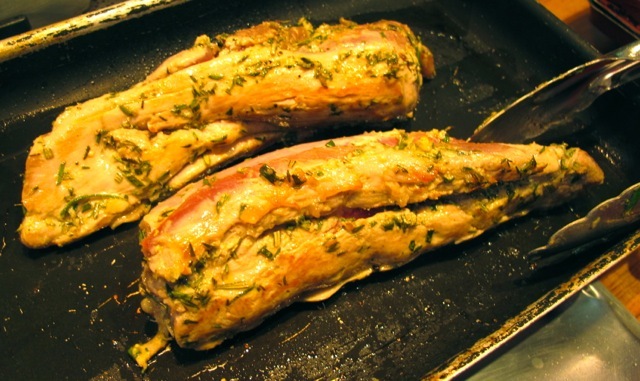 A pound-and-half will feed four easily, maybe six–and as tenderloins are usually of similar dimensions this allows you to double-up easily for big groups. A good dish for company then–and delicious cold the following day too. Another recipe from my new book Healthy Eating for Life to be published in January 2013. Combine the marinade ingredients in large bowl and whisk together. Bathe the tenderloin in the marinade. Place in a plastic box or plastic bag and store in the fridge overnight. 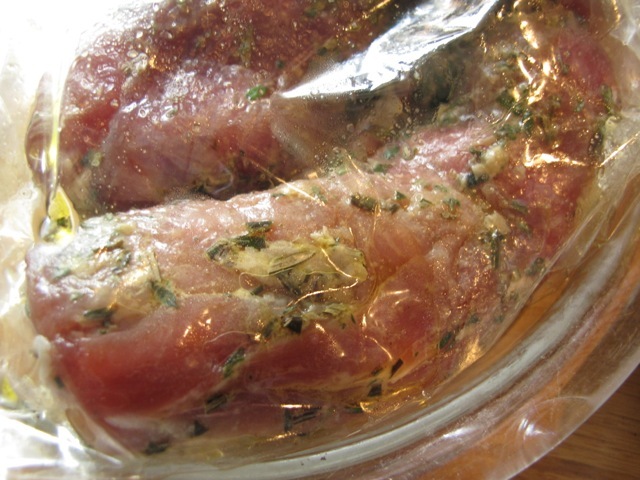 Let it come back to room temperature before taking it out of the bag/box and allow the majority of the marinade to drip off it. Set the oven to 200C/400F. 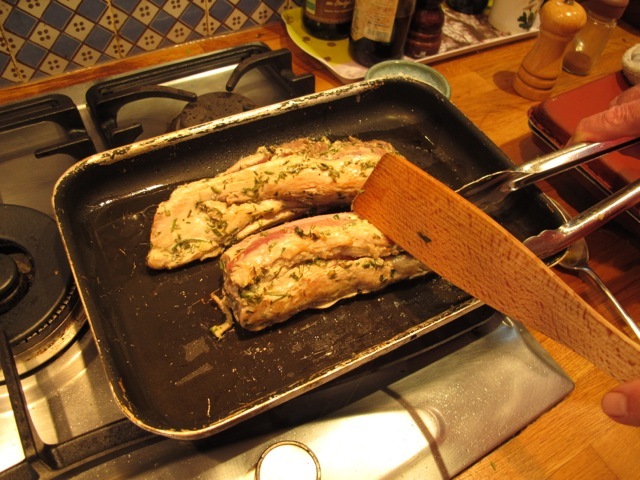 Heat the oil in an oven-proof pan; when it’s hot, “seal” the tenderloin in a tablespoon of olive oil. Put the tray in the oven and cook for about 20 minutes. After 15 minutes, check for doneness by gently presses down on the meat with a finger or thumb. It should be supple–but not too supple. Alternatively, slice into the centre of the loin to double-check. If the juices run pink, cook on for a couple of minutes. Try not to overcook as it renders the meat leathery. Can’t wait to try…but I’ll have to ’cause I just bought and dry-rubbed palette de porc to make a pulled pork BBQ that people raved about the last (which was the first) time :-). 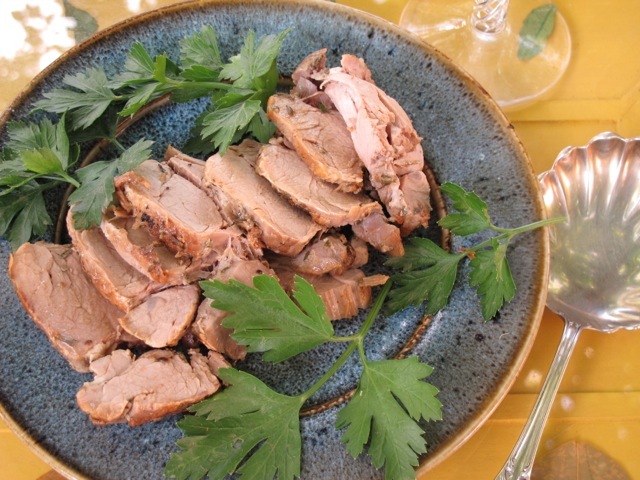 But enough about me, about YOU: what’s a pork tenderloin called in french ? One of my favorite meals so I’ll have to try this marinade soon. I never use a marinade just S&P and roast. Looks delicious – will make for dinner tomorrow. A lovely and versatile piece of meat. I often cut one on the slant, pound it just a little to make the mignons the same size, and cook quickly on the stove – the seasoning varies depending on what I am serving it with. This is a great favorite, even of my picky eater son. I will try this soon, sounds delicious and easy. Is there a certain temperature you could check to see when it just right? 145f is the newly approved figure. Robin, this marinade for a pork fillet (as it is labelled in Australia) was delicious. The cooking time was just about right, after the initial sealing of the meat to nicely colour it. Accompanied by steamed green asparagus spears with your ‘sauce’ and slices of baked sweet potato, it was a really delicious winter evening meal. Mmm Mmmm! Thanks Pam, you are a great ambassador! This is wonderful!! We actually cooked it on our grill outside last time. Delizioso! My children gobbled it up. We’re having it again this evening with courgettes with garlic and parsley. Nothing like a wonderful meal to bring a family together. I made this today substituting marjoram for rosemary and it was divine! I used a little water to deglaze the pan and the baking dish, put the resulting liquid into a small saucepan and added a small amount of chickpea flour to make a pretty tasty gravy. It seemed such a shame to waste all the tasty bits stuck to the pans.